I have recently discovered Tumblr. Yes, I am late to the party, but finally, I’ve arrived! 2. Youngins with clever thoughts and the inclination to express. 3. Pretty templates; much prettier than Pinterest. Less categorization than Pinterest too. 4. Another avenue to expand your reach. We’re not calling it a brand anymore, are we? Grow with Stacy posted a great piece about how refusing to add photos to your blog can kill your traffic. In it, she covered a lot of information in regard to imagery that I didn’t know (i.e. how to use Flickr to your advantage), and she’s right; humans are visual and images are important. Since Mommyland (writings, musings, opinions) leads my parade of social media, I will continue to use imagery to create added interest, much in the way that Stacy describes. Adding Tumblr to my list of social media stopping points (after Facebook, Twitter, Pinterest, and Reader) gives me one more destination on the daily Interwebz calendar of events. The benefit, it appears, is in its ability to open up the window to my soul from a purely visual perspective (there are poems, etc., but the words are far more image rich than the typical blog post). If you like the idea of a younger audience (be warned, you will come across many a pouting teenage girl – “I vant to be a star”), and love the idea of a visual stream of consciousness approach, log on to Tumblr and follow me. A friend of mine (a mom and fellow blogger who has been on the scene for the past seven years) and I had a conversation recently about the time one must commit for a long lasting future in social media to be possible. This got me thinking about why so many people don’t make it in the arena. As a relative newby, one might not consider me schooled enough on the factors that go into long-term success, but I do believe that I have grown my own set of skills (in the past six months) that give me some credibility. Success in social media requires near constant attention and time to build a brand, a name, something that people want to click back to, connect with or buy. Great blogs have failed not because they weren’t well written or received. Often, it’s simply because they weren’t given the chance to grow and change. It takes time to tweak one’s focus and find one’s path. A great many writer’s have escaped the blogging world and left us with blank paged URL’s. I see it everyday and I always wonder where they’ve gone. Tweeting requires an awful lot of updates, as does one’s facebook page. The nice thing about facebook, though, is that when you update there it goes directly to Twitter (if you set it up that way). You must remember to post with a hashtag or the tweet with your facebook link may never be read. How you choose what to post is also important. Ask yourself, do my words here have anything to do with my brand or would it be better to suited for my friends on my personal facebook page? There’s a difference between the two pages for a reason. Not everything I tell my friends do I necessarily need to share with my followers. Although, come to think of it, a lot of what I tell my followers, I’d never share with my friends. Maybe it’s time to combine my facebook pages into one? It’s a decision yet to be made. I read recently that the most successful tweeters do so in the afternoon. I spent the past couple of days looking at my followers traffic (and those I follow, too) and decided that this isn’t true for my area of interest. Most of the people with whom I’ve connected are runners, social media junkies, health promoters, and lovers of all things fashion. A huge number of them are moms, too. 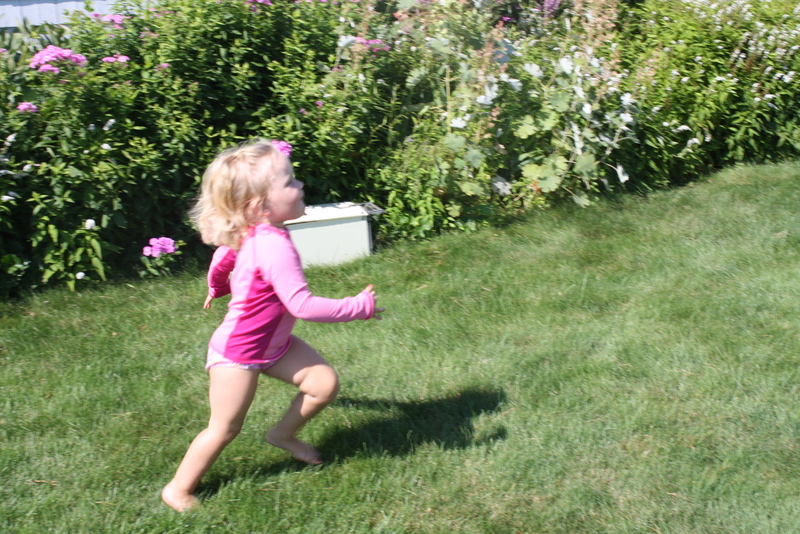 The mom factor makes afternoon posts difficult to accomplish. It’s the afternoon when the kids get out of school and need their moms for snack making and cooperative playtime in the back yard. Unless you are posting on your phone with one hand and pushing a couple of swings with another, it’s highly unlikely you are doing either job to the best of your ability. I decided (for me) that I wasn’t able to do both jobs at once and so Internetland only happens early in the morning when the kids are playing, early afternoon when they are in school, and late at night after the monsters are in bed. Pinterest is a fantastic way to build a brand. Start to pin things you like and soon you might be turned onto another pinner with a similar mindset. There are fantastic pinners (here, here, and here) who are growing businesses and share their aesthetics. I know that they spend an awful lot of time in the social media ocean based on the quality of their content and near constant updates to their pins. It’s necessary and important to continue to add to the images, since it acts as an inspiration board for yourself and others. It’s work. If you fall in love with it, you realize this. You keep traveling from facebookland to Twitterville, from Pinterest and in my case to Mommyland as I grow what I’m building. Most days I’m not sure what I’m building, but I am a social media toddler and it’s par for the course. The folks who have lasted and made names for themselves also began with an idea (and a voice), but it was their perseverance that grew their Internet credibility. I realized this week that lower stats and less time to post are a part of the game. The true definition of entrepreneurial spirit encompasses many qualities such as uniqueness, creativity, and adaptability. Success in social media, whether you blog or promote a business, build a brand through Pinterest or grow a particular facebook page also takes an awful lot of work. If you are like me and determined to make a place for yourself in it the advice is simple. Hang on and keep at it, because the working (like the training for a marathon) is where our skills are grown, new friends and relationships are built, and where together we can impact our communities with our words, pictures and ideas. Discovered by one of my favorite pinners. I only re-pin the things that really speak to me. This does on so many levels! Brand New World. New watercolor color way World Map Series found on Pinterest by Jessica Durrant. As I was saying.... pinned by Vanessa Johanning. Would never, but it goes with the post! I spent my Saturday in social media heaven. The blog was looking tired and needed a facelift, so I messed with themes and widgets, searched URL’s, and uploaded new images. The best part was when I figured out how to link up some of my favorite bloggers into a blogroll for my visitors. Many of the names on the list are kindred spirits; like-minded people who are enriching my life with their words and their work. Bloggers come in a variety of colors much like the rainbow. Some I’ve highlighted are obviously running based, many are family centered, and a few are more than effective in discussing the topic of writing. What they all have in common is great voice; imperative for page turning or in this case scrolling down. A photo I came across in my search for new images. 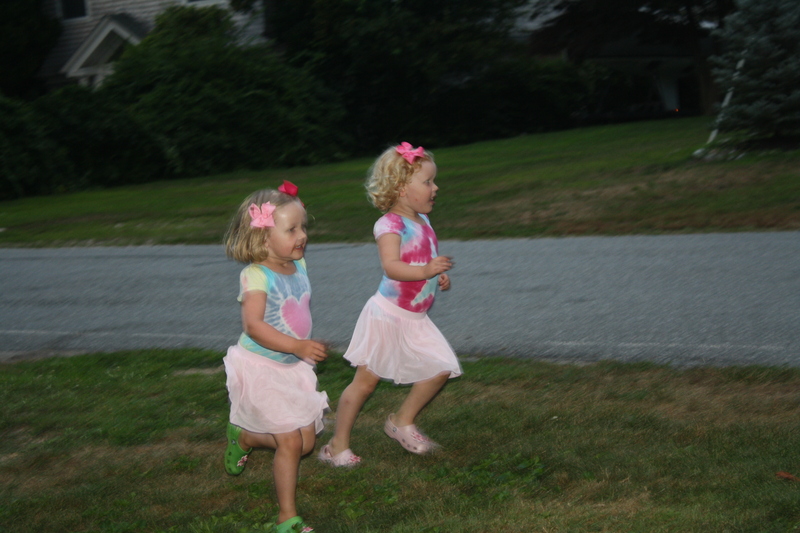 My girls running, Connecticut 2011. A few weeks ago Oprah tweeted to all of her followers a request to tune into her programming, especially if they had a Nielson box that affects the television ratings. The hoopla over her tweet was enormous. Her undeniable power to move the masses caused twitterers to both tune in and tune out. Many balked at the nature of her tweet. How dare she beg for watchers? With all of her power, was this unethical? As I continue to dip my big toe into the great pool of social media I find myself on both sides of the fence. Blogging, tweeting, and pinning are great if your goal is to share and it’s purely out of a desire to express oneself. It’s pretty well-known that if you blog to make money, it is very unlikely to succeed. Or is it? And how does one succeed in an area that is so saturated with like-minded individuals; most just as talented as the next? Should bloggers be more like Oprah or is it distasteful for mere mortals to ask to be liked? My blog began with the most innocent of intentions. It was a way for me to practice my writing and tap into that part of my soul, which needs to share with words. I used marathon training as the driving force, but received feedback on so many of my posts that were non-running related that the personal importance of it grew. Last week I entered Twitterland in an effort to see what was next on the horizon. I joined Pinterest, but have not yet pinned. What am I waiting for? The truth is that I am nervous, because failure is not an option. I know what I have to offer. I know that I can do anything if I put my mind to it, this marathon has reinforced that fact. I know I need to write and must somehow find a way to parlay my love into an actual future where I have something to offer my family. I am lucky to have a husband that provides for us, which allows me to have had this experience at all. But as our children grow I want them to see that their mothers’ work has value, too. And let’s be realistic, nice comments and higher daily bar graphs won’t pay for private schools and dream weddings. But they can and there are plenty of bloggers who have made it happen. I am certain she would tell me to be authentic and to keep on working. That little voice in the back of my head says the same thing, though without as much force and certainty. There may never be more to my social media experiment than what it is right now. I might have to be okay with twenty-three people liking my facebook page and fifty-three followers on Twitter. I am grateful for each and every click. I’ve never been the kind of girl to ask to be liked. It leaves too sour a taste in my mouth, so I’ll continue to let the work speak for itself. The reality of the situation is that I’ve already taken the big leap by starting the blog at all. More than just my big toe is making circles in the social media pool. In fact, social media is much bigger than a pool with heated water and a smooth tiled bottom. It’s more like an ocean full of unknown and undiscovered entities, fierce and angry sometimes, smooth and beautiful, too. I am currently immersed in the social media ocean and am carefully treading water (using all of my skills as a flotation device). Now, it’s just sink or swim. I suppose I needed to write this post as a reminder to myself of something I don’t think I’ve ever mentioned. I’ve always been a very good swimmer. 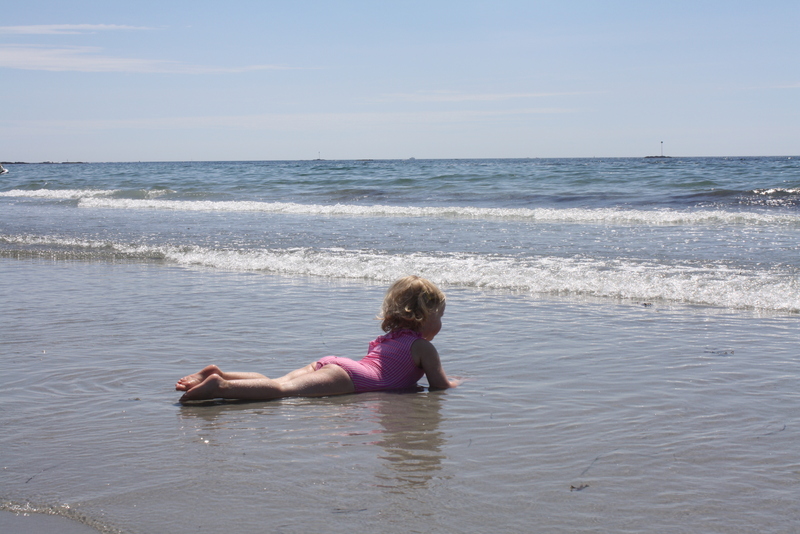 Grace and the ocean. One of my very favorite pictures! I mustered up the courage yesterday to venture back to Twitter. Despite my initial misgivings of being followed by strangers, many of whom are actual hookers, the prize for taking the plunge was a conversation with two old friends. I not only got advice on how to block the harlots, I also planned my next race with at least one partner; a Summer half marathon in late July. On the running front, my return to the land of the living with my (now only) partially stuffed nose, allowed me to cruise an easy five before Brian left for work. I was kind to myself, and even though I was connected to the Garmin, didn’t check it much. 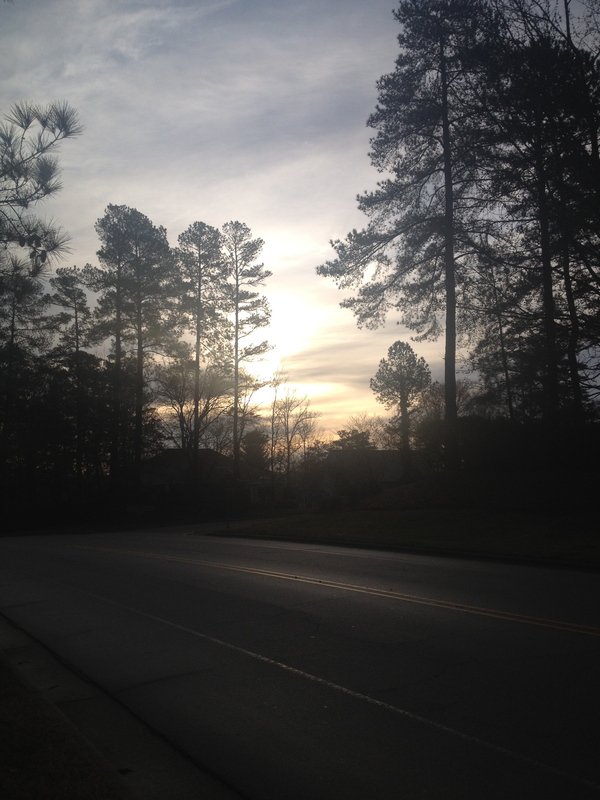 Running without a focus on time allowed me the opportunity to breath in the morning. A beautiful morning it was and I’m pretty sure Spring will be sprung before the Winter is officially over. Thanks to all the well wishers who helped to speed me toward a faster recovery. Your thoughtful words, mixed with the orange flavored melt in the mouth Zicam, and an easy (get back out there) run have made me feel so much better! My early morning run. It was actually brighter and more beautiful than the picture. In the past two days I have written about my mid-week run, food, routines, other bloggers, infertility, changes to a schedule, social media and running socks. All of them have ended in the trash can. I haven’t quite figured out what is going on, but I wonder if my excitement over meeting my birth family, and my subsequent social media sharing (not to mention the overwhelming positive feedback), has got me a little gun-shy about hitting the publish button. How much sharing is too much? How much information should stay private? We have a saying in my house, “Sharing means caring.” This cheesy little phrase worked wonders with two-year olds who fought over a single toy. It still works when my four-year olds fight over the one Dora book found at the library, or when one wants to sing a song out loud (without her sister chiming in). Sharing makes things better. Sharing is kind. Sharing means you care. Over sharing, though, is an invasion of another person’s space, isn’t it? Don’t we all deserve to sing a song alone? Should I really make Grace share her Dora book, considering she carefully searched for it alone, amongst all the other D’s on the kiddie shelf? I suppose, as adults, we have the right to click close if we take issue with another person’s position or voice. Do I really want to make another person feel that way, like I’m imposing on their space? What have I gotten myself into with this blogging, then? Writing is sharing, and so I need to get over this hump. A therapist I once saw told me that I see things in black and white. I struggle with balance (it’s the libra in me), so I often question myself when something goes too far in one direction. If something creeps way over the happy line, I get anxious and start looking for a little blackness to balance the white. It’s the same if something feels too dark. Not the greatest quality I possess, but part of the internal balancing game that makes me who I am. Maybe if I take the advice I give to my kids, I won’t feel like I’m teetering on the Libran scales. I am sharing because I care. I care about what I write. I care about the people who read my words, even people I don’t know. I share my thoughts because it is part of my journey, which isn’t black and white at all, but filled with the most beautiful shades of gray. You are currently browsing entries tagged with social media at Running in Mommyland.